Nostalgia can be so bittersweet, especially when it's unexpected. This morning, I dropped my car off for service in Ballard. 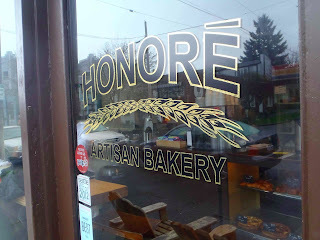 There was an hour to kill, so I walked to Honore, a lovely bakery that makes beautiful and delicious pastries. And, boom, I found myself on the street where my great grandmother, Signe, lived when I was a little squirt. We called her GG, which sounds vaguely French, but she was straight-off-the-boat Swedish, one of those big, soft, old-world women who smelled like lemon drops and moth balls. There, on my morning walk, I spied the kitchen window I had looked out of many years ago while drinking coffee with cream and three teaspoons of sugar. At that sturdy table, she fed us damn fine fried chicken. Sheee-con, she pronounced it. She used to buy a live bird at a butcher down the street. They'd slaughter it and she'd bring it home and bread it and fry it and -- not really sure why -- she'd finish it in a pressure cooker. It was tender, but soggy. Like the pork in sweet and sour pork. Walking past that house stirred some powerful memories. Of riding the bus downtown with her, of being slightly embarrassed because she seemed addled with age. Of watching her make delicate cookies at Christmas and of the feud that simmered for years between she and her daughter, my grandmother, Sigrid. The true story of their festering rancor is buried with them. There's nobody left to illuminate the hurt. When GG died, she left her daughter $10 and said it was because she had been to see her once in the past 20 years. She actually put that in the will. That had to burn my grandmother because she cared about money so deeply. GG left me and my sister and brother a whole bunch more than that, to be in trust for us until we turned 21. The $12,000 I received was like a fortune back then and I put it to good use, traveling around Europe after college, discovering so many incredible flavors and having a mostly wonderful time. That gift sent me down the path that I'm still on today, the never-ending search for food made with love and the stories behind the people who grow or make that food. I ordered a croissant at Honore, and it did take me back, flashing on the first time I had a real French pastry on my very first trip to Paris. It sounds so corny, but that bite changed my life for the better. At most barbecue competitions, the focus on cooking tough pieces of meat low and slow. The embers of charcoal and/or wood coax maximum tenderness from shoulder and brisket after a long, long time. Pitmasters stay up all night, making sure the fires burn evenly. That's true commitment and you can taste the love. That's probably why I respect and admire these slow cookers so much. There are no short cuts, no tricks they can play to create the most memorable bites, what they hope will be a grand champ after the meat has been turned in, tasted and judged. But there was a delicious detour from the low-and-slow agenda at the first-ever Kingsford Charcoal Invitational, held last fall near St. Louis. The teams gathered to cook in this competition represented the best of the best, the ultimate battle of the Grand Champions, and it was so on. While this was by far the smallest competition I've ever witnessed, it was also the most dead-serious. Sure, a few beers were enjoyed, but everybody brought their A games, many hauling their custom rigs great distances to participate. The warm-up to the big show, the tasty tease, if you will, was the One-Bite Challenge: Prepare an appetizer lickety-split using just five ingredients, grill it and wow the distinguished panel of judges, including my pal Amy Mills. I'm not going to reveal who won the One-Bite because it's all going to be featured on an hour-long show March 17 on Destination America -- part of a BBQ Pitmasters marathon! I'll just say that I was completely in agreement with the judges. It's easy to enter. Just submit your five favorite ingredients and a recipe name to Grilling.com. Entries are accepted until April 15. Oh, and here's a fantastic recipe from that challenge cooked up by the reigning barbecue queen, Melissa Cookston. Go Yazoo's Delta Q!! 1. Preheat a grill to medium-high heat using Kingsford® charcoal. While grill preheats, peel and devein shrimp, leaving tails on. 2. Cook bacon directly on the grill grate until it is close to being fully cooked, but is not crispy. Set aside. 3. Slice cream cheese into 1/4 x 1/4 x 1/2-inch long slices. Select pickled jalapenos that are roughly the same dimensions as the cream cheese. Remove stems and seeds. 4. Place one strip of cream cheese and one jalapeno piece on each shrimp, then wrap with a slice of grilled bacon. Secure with a toothpick, then place the shrimp with tails on the cool side of the grill so they won’t burn. 5. Cook for 2-3 minutes until bacon is crispy and the shrimp is pink throughout. Remove from fire, brush liberally with Thai sweet chili sauce and serve. Recipe created by the Yazoo’s Delta Q competition barbecue team for the One Bite Challenge category of the Kingsford® Invitational.